The Right Path to a Hypothesis: to Surprise and Delight Customers. On the 13th of October we were treated to a guest presentation by Anthony Lee, Product Manager from Tatts Group. He talked about his journey to Surprise and Delight his customers. Here is a brief summary of the material he shared with the group. Anthony is a big believer that Rome was not built in a day. Same deal for a product. 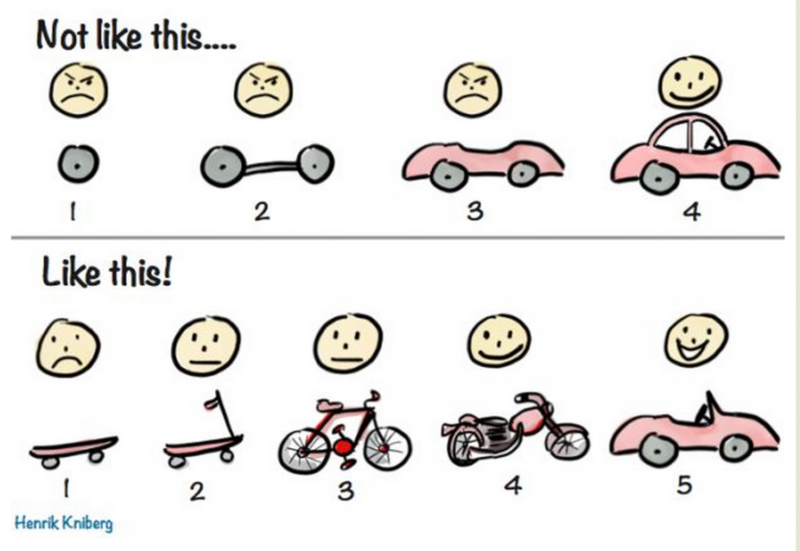 Build the product in increments, but importantly, when you do make sure you are delivering value with each iteration. The analogy is the mode of transport graphic below. At Tatts Group there have been several iterations of a device for their live betting product found in bars and clubs across the country. The approach taken has always been to build to solve the problem, gather feedback from users on the experience and then iterate new versions. The idea is to add more value and improve the overall experience with each evolution of the device. Anthony and the Tatts team spends countless hours in bars and pubs around the country gathering first hand intelligence from users of the system. Hey, it is a tough job, but someone has to do it. 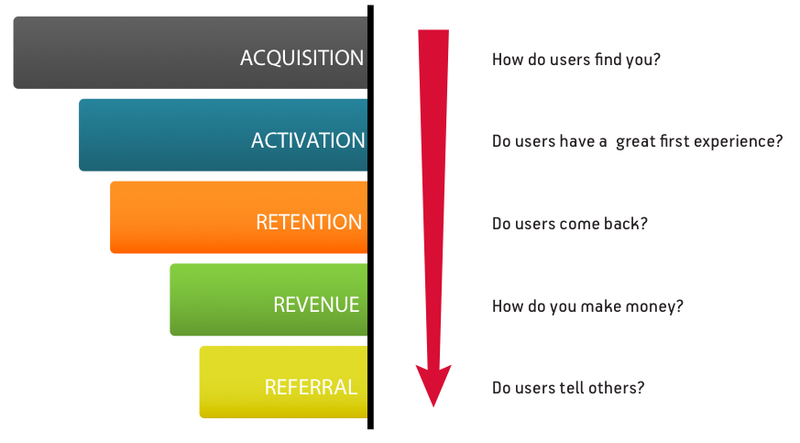 It is a simple and powerful way to measure your usage and sales performance, popular in the startup community. You can gather qualitative and quantitative data this way and focus your efforts on whichever part of your customer funnel is lagging. Anthony’s learning journey around surprising and delighting customers really started to form during his time at Wotif. Here he spent a lot of time performing spilt tests, user experience testing and quantitative analysis. What he learned though is that without the right kind of hypothesis to test you are not necessarily focusing valuable resources on solving customer problems. A split test with the wrong hypothesis is just testing the best results out of two options. Hypothesise, grounded in user research, are critically important to set the right objectives for any development work. Split testing this then gives you a way to best solve the problem. 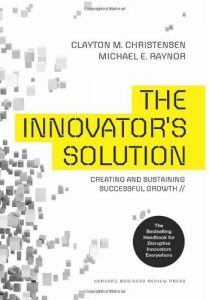 Quick reference was made to this book that provides a solid grounding for existing business to run effective innovation programs within the business. A particular facet Anthony drew attention to was around effectively competing with a new solution against an incumbent competitor. Sure, initially the incumbent solution may cover the low end and high end customer requirements. But, over time many products are continually development to the point where the products capability extends outside the needs of the customer. It becomes over engineered. 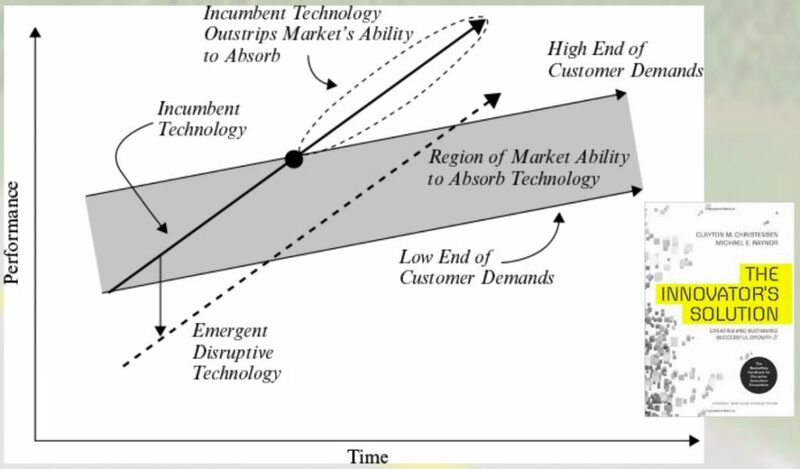 This can then mean that continual investment in the incumbent product does not provide value to the customer. You can look up the book relating to this concept here. 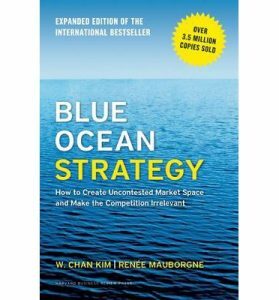 The next concept that Anthony uses to ground his frame of reference is Blue Ocean Strategy. This concept operates on the premise that profit comes from sustained competitive advantage. A product can sustain competitive advantage if it is valuable, rare and hard to copy – it is differentiated. In many markets, over time, differentiation reduces to a point where the only point of difference is the price. In this situation of competitive party profit margins are slim or non-existent. This is the blood, red ocean of high competition and ravaged businesses. Blue Ocean Strategy gets you thinking about how to exploit your organisations core competencies to solve new problems in uncontested markets. Vast blue oceans of profit can emerge when you apply what you do well to solve new problems in novel ways. 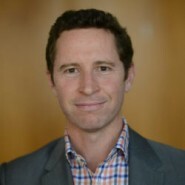 Tatts Group has some unique opportunities to provide solutions into sub segments of markets with little to no competition – pure monopoly. So, it makes sense to innovate aggressively in those spaces to maximise the opportunity for the business. That is the market segment Anthony is focusing on currently with his live bet solution. His priority is to develop broad adoption of this solution. Surprise and Delight is strategy to achieve that adoption. You can read more about Blue Ocean Strategy here. Most of us have heard about or use the concept of MVP (Minimum Viable Product) as an agile way to bring a new a solution to market. It is efficient and helps you iterate your investment in an informed way. Anthony extended on this to remind us all that sometimes a product will be well served if it has not only the core, essential functionality, but something in there that offers customer delight as well. 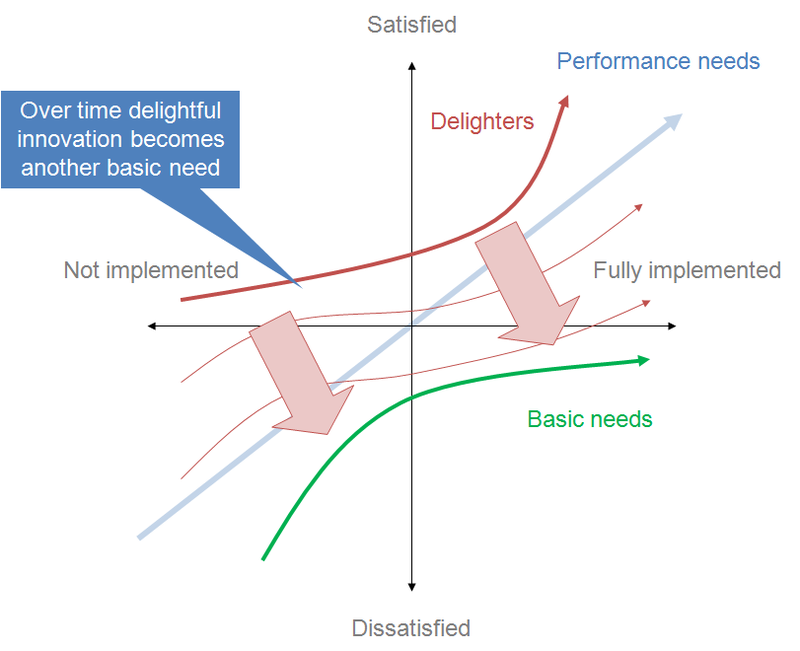 For this the Kano Model can be used. It ensures there is an awareness and focus on the different types of value (quality) a product feature brings to the customer. Delighting customers requires more than just complying with functional requirements. This is why great UX Design has become so important when delivering a solution to the market. So, how do we ensure we are solving the right problems and delivering the right kinds of value that meet needs and delight customers? Leave the building! Talk to customers! But, you can’t really ask customers what they think the answer is. True, they have a unique perspective of using your product. But, that does not make them qualified to prescribe solutions. What they are more than qualified to do is articulate the problems, or challenges that they have. When performing customer research, do not make the mistake of framing your line of questioning that puts the customer in a position where they are prescribing solutions. More often than not they will try to tell you what they think you want to hear. They can even lie to themselves in the process. Your task is to get from them a well-articulated summary of their NEEDS and the impact of those needs being unmet. Ask open questions, not closed questions. This helps you uncover information you have not thought about. Don’t ask leading questions. Your bias can hide the best insights from your customer. Ask about values indirectly. Often people will portray an ideal state when asked appropriately. But, with a different question you can often find the reality. An example is, ask someone how often they go to the gym. Then, ask them how often they went last week. The answers can clearly portray an idealised state and a real state. Product Managers are messages of the market. Take those messages of NEED and present them to your solutions team to formulate solutions that meet the need. I always like to see a Product Manager reflect on the Innovation Adoption Curve. This is a good reminder that customers buy at different stages of a product’s maturity. By thinking about this you can consider how you might segment your addressable market by those that are early adopters, versus those that deliver the profit: early majority and late majority. In this situation though, Anthony called out something called the chasm. 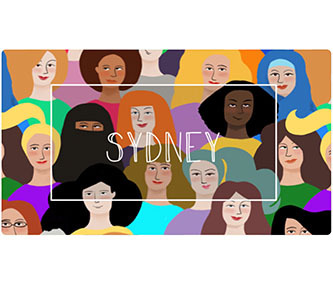 It is the point where the step from early adopter to early majority can be, well, more like a leap than a step. Early adopters tolerate imperfections, rough edges and missing functions. Majority markets typically do not. 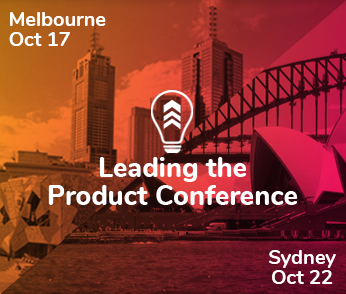 Achieving Product-Market Fit is an effort. But, the hard work does not stop there. You need to continually focus your iterations on meeting the next segment of your market. 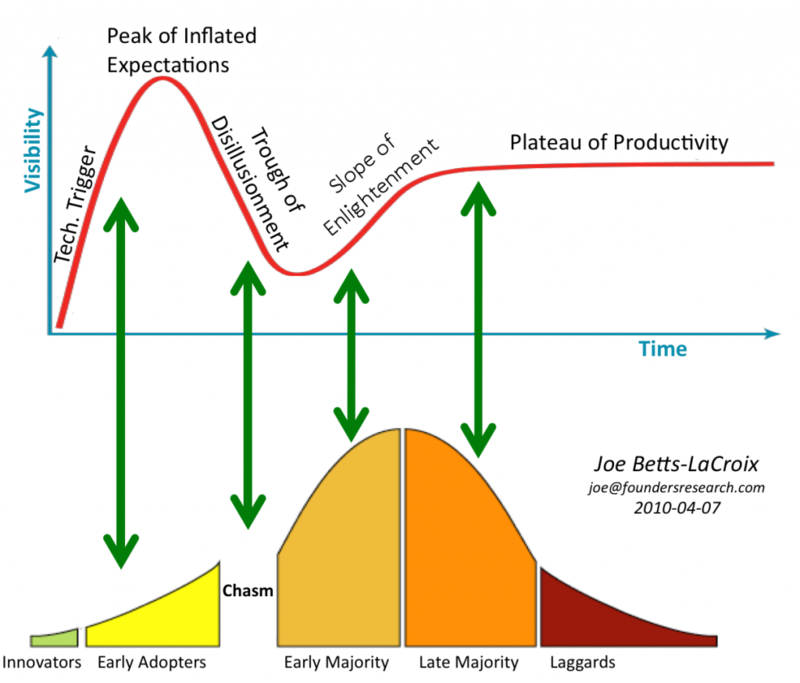 Also, if you like Gartner’s Hype Cycle concept then you will like this graphic. It is a novel way of looking at innovation adoption through a cycle of high expectations, disillusionment, realisation and acceptance. You can take a look at Anthony’s presentation at any time by clicking here. 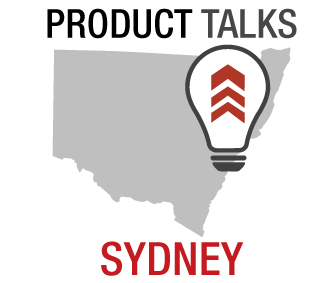 To be notified of future events, make sure you are registered with Product Talks Brisbane. It’s free. Finally, you might be interested in joining us at our upcoming courses, Essentials of User Experience and Customer Interviewing and Insights for Product Managers. Product Marketing subject-matter-expert. Ask Sean about go-to-market strategy.